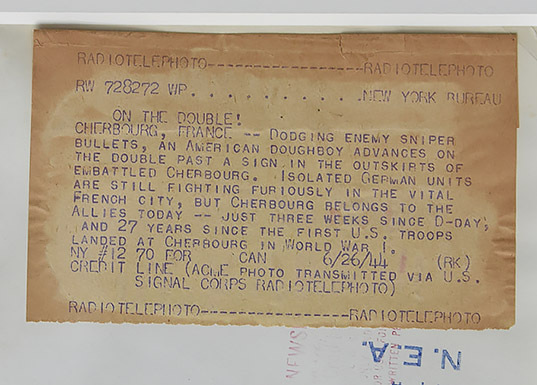 So reads, the caption, typed on back the original print of a historic photo made by Robert Capa just three weeks after the D-Day landing at Normandy in June, 1944. The photo was a gift to the National World War II Museum, made possible by the generosity, and some quick thinking by David Oestreicher and his wife, Tiffany. 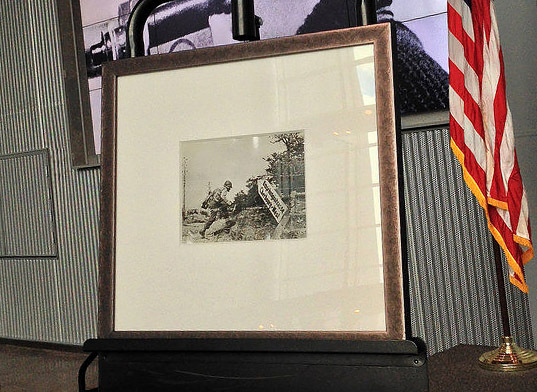 Thanks to this gift from the Oestreichers, the Museum now possesses the original silver gelatin print — made in 1944. Born October 1913 in Budapest, Hungary, Capa began his career in the 1930s. Well known as a wartime photojournalism, Capa’s style was to capture up-close perspectives of troops in conflict. His images are some of the most poignant from the war. The photograph donated by the Oestreichers, is titled “American Troops Approaching Cherbourg, France,” depicts a scene on June 26, 1944—three weeks after the Americans’ D-Day landing during World War II—of an American soldier leaping towards a hedgerow with a rifle in hand as he dodges enemy bullets. It is an 8″ x 10″ silver gelatin photo that includes the original wire service caption and label on the photo’s backside. 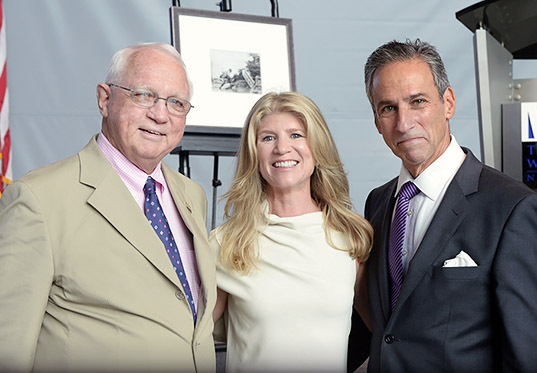 “The addition of this photograph to the Museum’s collection is not only exciting for the Museum; it is a great contribution to the collection of culture in New Orleans,” said Gordon H. “Nick” Mueller, Ph.D., President & CEO of the museum. “Capa’s work set “the gold standard . . . for war photography,” Mueller said. How the photograph made its way to the Museum is an interesting story: While on a family trip to London, New Orleans attorney David Oestreicher and his wife stumbled past a gallery exhibit of Capa’s works and wondered if WWII Museum had any in its collection. David secretly purchased the photograph, then presented it to his wife, who in turn joined him in donating it to the Museum. Together David and his wife, Tiffany, seek to put the city of New Orleans on the map as a cultural mecca for visual arts. Their involvement and leadership in local cultural organizations such as the New Orleans Jazz & Heritage Festival and Foundation, and the New Orleans Ballet, are just one part of that effort. Inscription on back of a historic photograph made by Robert Capa in Cherbourg, France in June, 1944. Just three weeks after the D-Day landings.